Low maintenance base– you can just wipe this unit down with soap and water. In addition there are no grout joints to have to deal with! Stays warm – Acrylic stays warm to the touch so you don’t have the shock of your feet touching a cold material when you enter the shower. Waterproof – acrylic is non-porous so you don’t have to be concerned about waterproofing the base – because it’s already waterproofed! Bench seats can be integral to the unit – one of the challenges with tile showers is how to make sure a bench or corner seat is installed properly. With an acrylic base this worry does not exist because the seat can be made as part of the unit. More cost effective than a tile, marble, or solid surface shower base – Since these units are manufactured in larger quantities they will usually cost less than custom tile showers or solid surface units. 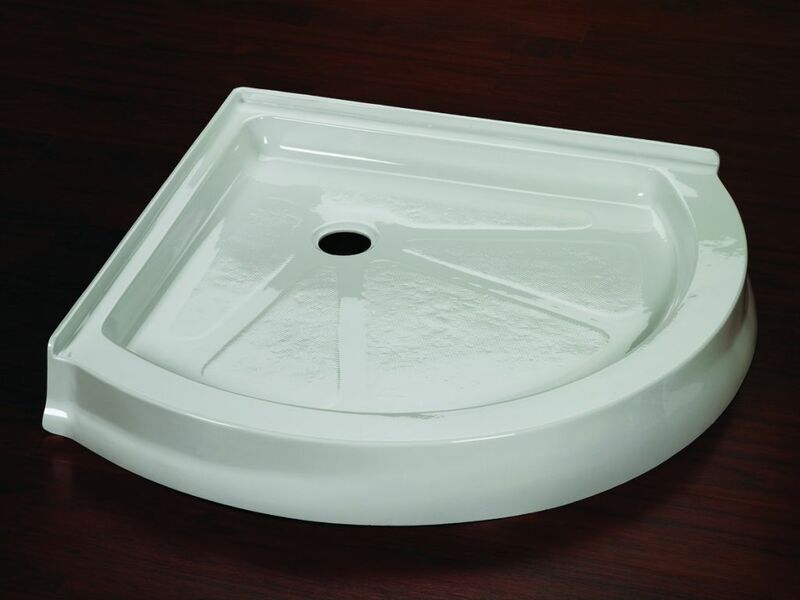 Light & easy to work with – Most of these bases are set into a mortared base and are much lighter than marble or solid surface pans so they are easier to maneuver around a small bathroom. Cannot create custom sizes – since these units are made in standard sizes if you need a custom size acrylic will not be the option for you. Drain location cannot be varied – in remodeling projects it can be helpful (and save on plumbing costs) to use the old drain location. Since drain locations are pre-set with an acrylic base you may have to move your existing plumbing. More expensive than fiberglass – if you’re looking for the cheapest shower base – fiberglass will be a better choice than acrylic. Not generally associated with high end projects – most high end luxury homes will choose tile, stone or solid surface showers vs. acrylic. Shower base with a bench seat – If you’re looking to increase safety or are just looking for a place to sit down to shave your legs adding a bench or corner seat can be the answer. 60 x 30 base to convert a bath to a shower – With the trend for people to want to remain in their homes longer tubs are increasingly being removed in favor of showers. Acrylic bases in a 60 x 30 and 60 x 32 rectangular sizes are the most popular size for this type of project. Unit for both clear glass enclosures or glass block shower walls – Acrylic bases are not just for standard clear glass stalls – there are acrylic bases in 60 x 34 size (for a bath to shower conversion) and a two wall 72 x 51 size using glass blocks (which are easy to clean and have a contemporary look). Unique shaped bases – You’re no longer limited to square, rectangular, round and neo angle bases. Cool designs from companies like Fleurco come in shapes called “Slice, Roman Half Curved and Bowfront” to create unique looks at affordable prices. No barrier bases – if stepping over a shower curb is a problem choose a barrier free base to make the space safer for everyone to use. What questions or experiences do you have with different shapes, styles and shower base systems? Please comment below. If you’re looking for more information or an estimate on remodeling a bathroom or nationwide supply of our unique Fleurco shaped shower bases contact The Bath Doctor in Cleveland (216-531-6085), Columbus (614-252-7294), nationwide (877-668-5888) or Cleveland Design & Remodeling (216-658-1270).